On January 31, 2019, the Chester County Planning Commission (CCPC) provided their comments to the FERC Draft Environmental Assessment for the Adelphia Gateway project. To view documents related to the Adelphia Gateway project, visit the FERC website, select "General Search" from the eLibrary menu and enter the docket number "CP18-46" in the Docket Number field. The CCPC also created a map of the Adelphia Gateway route and proposed Blowdown Assembly and Main Line Valves in Chester County. 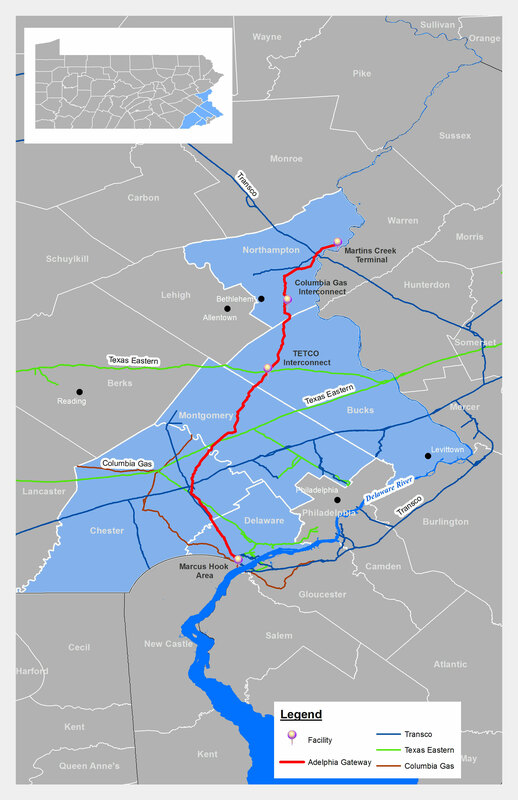 On January 4, 2019, the Federal Energy Regulatory Commission (FERC) issued the Draft Environmental Assessment (EA) for comment on the Adelphia Gateway Project. The FERC Docket Number is CP18-46. To view the Draft Environmental Assessment, visit https://elibrary.ferc.gov/idmws/docket_search.asp and enter Docket Number CP18-46 into the search box to retrieve a chronological listing of documents. Comments may be submitted to FERC via mail or through their e-file system within 30 days of their posting date of January 4, 2019. On October 19, 2018, the Federal Energy Regulatory Commission (FERC) issued Notice of Schedule for the Draft Environmental Assessment (EA) for the Adelphia Gateway Project. The Issuance of the EA is scheduled for January 4, 2019. The FERC Docket Number is CP18-46. View the FERC Announcement. Comments may be submitted via mail or through the FERC e-file systems, and are due to FERC within 30 days of the posting of the Draft EA. When the EA is made available, a link will be posted. You can also view Adelphia’s application on the FERC website. Select the eLibrary link from the left hand side (green and white image of a computer mouse), select eLibrary from the left column, and then use the "general search" for the Adelphia Gateway Project, and enter Docket Number CP18-46. You can also find information on the proposed project on the company's website. Contact information listed for the project is 800-843-3179 or info@adelphiagateway.com.